En 1943, Montreal Locomotive Works inició la producción en serie del Sexton SPG, desarrollado a partir del RAM II. Se produjo un total de 2150 vehículos hasta 1945, de los cuales 125 se denominaron Sexton I. 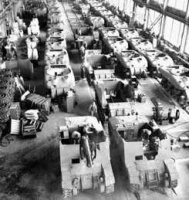 In 1943 the Montreal Locomotive Works started mass production of the Sexton SPG, developed on the basis of RAM II. A total of 2150 vehicles were produced by 1945, of which 125 were designated as Sexton I. Almost 100% identical to the Sexton II, making it the most pointless premium tank in game. A basic SPG. Not super accurate or hard-hitting, but rapid firing. Expect to bounce quite a few shots if shooting heavily-armored foes. However, the high rate of fire somewhat helps negate this. Makes fair credits for a Tier 3 Premium tank, but nothing spectacular. - First, the crew positions do not match well with other British SPGs. For example, the Radio Operator Position in only found on one other SPG - the Sexton II. Also, 3 British SPGs have 2 Gunners while the Sexton I only has one. - A second issue is the low experience point generation. This tank does not have a XP gain modifier like most Premium tanks - the XP generation is the same as the non-Premium Sexton II. This noticeably limits the rate you can train crew and dramatically reduces its usefulness to train high-tier SPG crew. 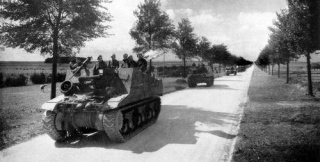 The 25pdr SP, tracked, Sexton was a self-propelled artillery vehicle of World War II, based on an American tank hull design, built by Canada for the British Army, and associated Commonwealth forces, and some of the other Allies. It was developed to give the British Army a mobile artillery gun using their Ordnance QF 25 ponder gun-howitzer. From 1943 it replaced the US built M7 Priest (US 105 mm guns on a M3 Lee tank chassis); these had replaced the British Bishop (25 pdr on Valentine tank chassis) which had been improvised in 1942. 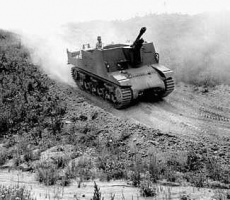 In 1942, the US supplied enough M7 Priest self-propelled howitzers to equip a number of British Army artillery units in fighting in North Africa. The British found the Priest to be an excellent weapon, which gave artillery the same mobility as tank units. However, the Priest used the American 105 mm howitzer rather than the British equivalent, the QF 25 ponder gun-howitzer. Having to supply different ammunition for a few units complicated supply for the British Army. The US attempted to fit a 25 ponder to the M7 Priest - producing the T51 in mid 1942 - but the program suffered delays including the destruction of the gun mount on the prototype during the first live-firing exercises. US resources were not available for a vehicle solely for British use so Britain turned to Canada. 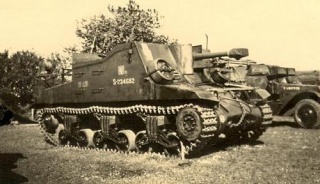 The Canadian Army Engineering Design Branch through the Canadian government's Department of Munitions and Supply were asked to build a vehicle similar to the M7 on the Ram tank chassis. 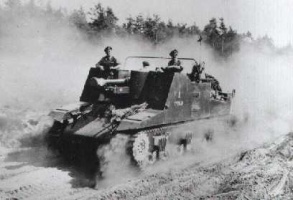 The Ram tank was a Canadian tank design that used the chassis of the American Medium Tank M3 as did the Priest. The Ram had been sidelined by a decision to standardize on the Sherman tank for British and Canadian units. A prototype was completed on 23 June 1942. Following trials in Canada, the Canadian government ordered 124 vehicles in three batches. 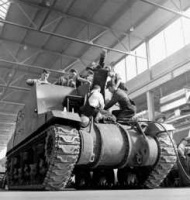 The prototype was shipped to the United Kingdom in early 1943, where it underwent further trials; the vehicle was found to be highly satisfactory and was given the designation "Sexton" (after the religious custodian) in May 1943. 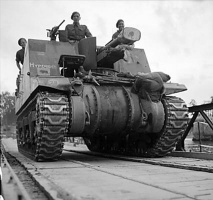 The British government ordered 300 Sextons in the summer of 1943; however, these Sextons were to be built on Grizzly tank hulls (Canadian-built M4A1 Sherman tanks) instead of Ram tank hulls. The Ram-based Sexton was designated as the Sexton Mark I and the Grizzly-based Sexton was designated the Sexton Mark II. British orders for the Sexton II eventually totaled 2,026 vehicles. Unlike the Ram, which was inferior operationally to the Sherman and never saw combat as a gun tank, the Sexton was successful. Between 1943 and 1945, the Montreal Locomotive Works manufactured a total of 2,150 Sextons for the use of both Canadian and British forces. The vehicle entered service in September 1943. 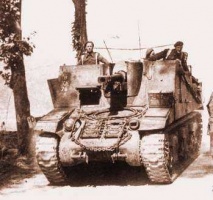 The vehicles were first used in combat in Italy by the British Eighth Army. 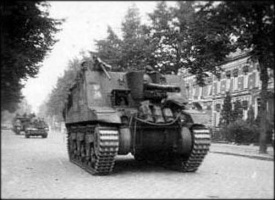 Later Sextons took part in the invasion of France and subsequent Battle of Normandy and the campaign in north-western Europe. During the D-day landings a number of Sextons were ordered to fire from their landing craft as they approached the beaches although the fire did not prove to be very accurate. In spite of its confused origins, the Sexton was a combination of proven parts and proved to be a successful design and remained in British service until 1956. In oppose to Germany, which often used its self-propelled guns (assault guns) in a front line direct fire role, Britain and Canada only used the Sexton for indirect supporting fire. 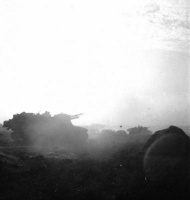 They kept the Sextons well back from the front line and used forward observers to direct overwhelming fire on a target. 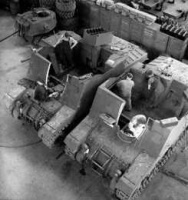 Two Sexton SP armed with a 25pdr being built in a Canadian factory. 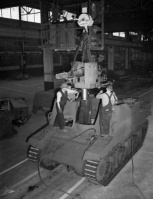 Workers assembling a Sexton self-propelled gun at the Montreal Locomotive Works, Montréal, Québec, Canada, August 1944.